Let’s be frank, towns and cities across the North of England have been hammered by Tory imposed austerity from Whitehall. What will be of no surprise to anyone is the fact that the cuts have not been as bad down South up to this point – with no change forecast in the years ahead. Decisions made in Whitehall have meant that cuts to our communities have cost the equivalent of £324 per person across all of Greater Manchester, compared to 2010. This is not only unsustainable, it’s wrong. 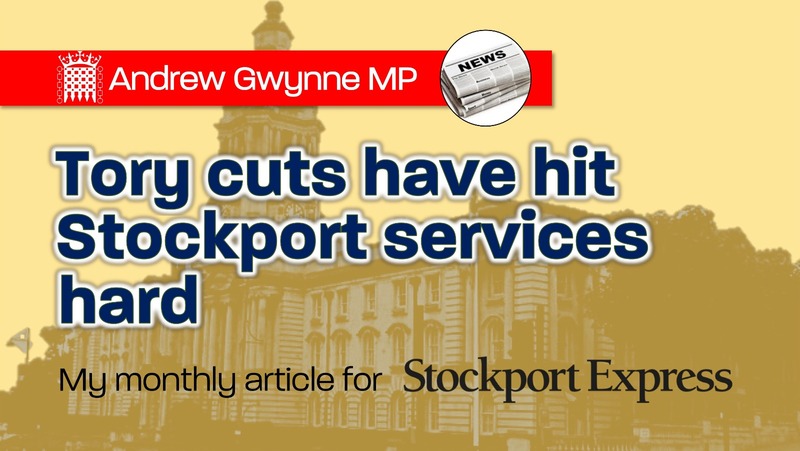 Sadly Stockport Council has not been immune to this financial assault from Ministers either. Political austerity has harmed Stockport. Decisions made by Tory Ministers mean that Stockport Council must make a further £47 million reduction in funding for community programmes by 2022/23, on top of the £100 million already slashed. To put this into context that works out at a cut of £164 for every man, woman and child in Stockport since 2009/10. Behind the finances and budgets there is a human cost however. Cuts and rising demand have seen the largest rise in looked after children ever with Stockport taking care of 382 children – a 30% increase from 2016. And on top of all of this, the Government expect our children to go to schools falling into disrepair with Stockport today receiving £48 million less for school maintenance compared to the last Labour administration from 2010. But despite all of this, Labour in Stockport is doing all it can to reform rather than cut in order to protect our communities. Stockport Labour have brought forward £14 million for a new Special Educational Needs School (Lisburne), and allotted £25 million for vital school fabric repairs, including roofing. Stockport Labour is investing over £4 million in renewing Stockport’s parks play and sports equipment, using money left over from Section 106 contracts which the previous council administration neglected to audit. And when it comes to building the affordable homes we need, Stockport Labour, with Council owned Housing Partnership Viaduct, have delivered, or are currently delivering 600 homes, and plans to bring this figure to 1000 within 3 years. Notwithstanding this herculean effort from Stockport Council staff and councillors, this perfect storm of cuts cannot continue. Our most deprived communities and most vulnerable citizens are at risk; rather than the smoke and mirrors offered by this Tory Government, our communities need support, and they need it now.